Say Aloha! to your new favorite no-bake cheesecake recipe! It's super light and creamy, made with cream cheese, whipped topping, and a packet of gelatin. Mix wafer crumbs, butter and cinnamon; press onto bottom of 9-inch springform pan. Sprinkle gelatine over reserved pineapple juice in small saucepan; let stand 1 min. Cook on low heat 3 min. or until gelatine is completely dissolved, stirring occasionally. Beat cream cheese and sugar in large bowl with mixer until blended. Gradually beat in gelatine mixture until blended. Refrigerate 30 min. or until slightly thickened. 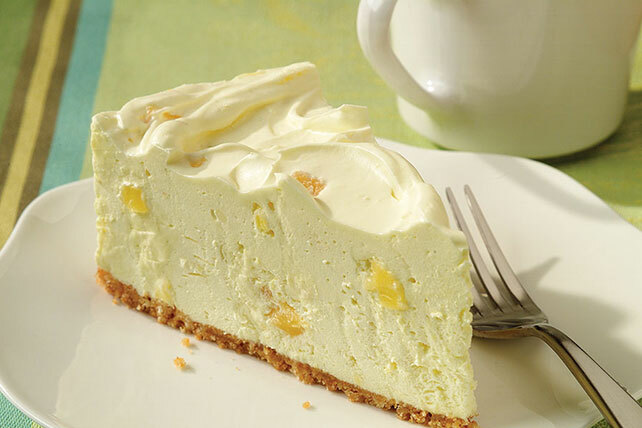 Whisk pineapple and COOL WHIP into cream cheese mixture; pour over crust. Refrigerate 5 hours. Save 60 calories and 8g of total fat, including 5g of sat fat, per serving by preparing with reduced-fat vanilla wafers, PHILADELPHIA Neufchatel Cheese and COOL WHIP LITE Whipped Topping.